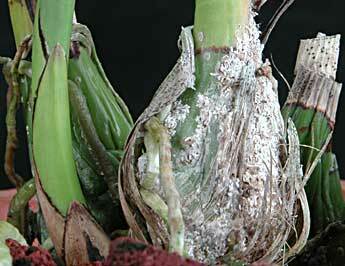 Scale is probably the most important insect pest of cultivated orchids in northern climates. According to a Florida Department of Agriculture and Consumer Services publication, there are at least 27 species of scale identified from cultivated orchids. Fortunately, only the most common soft scale, usually referred to as brown scale or brown soft scale, regularly survives in the north on indoor or greenhouse plants. The soft brown scale (Coccus hesperidium), and possibly the similar elongate soft scale (Coccus longulus), seem to be the most observed species. Boisduval scale (Diaspis boisduvali), an armored scale, can infect orchids in the greenhouse and the home, and should be guarded against. The adult brown scale is recognized by light yellowish to dark brown oval to circular shells appearing on leaves, petals, sepals, petioles, pseudobulbs, and sometimes rhizomes and roots. Mature female Boisduval scale are rounded and lightcolored, while aggregations of males are identified by their cottony appearance, which may cause them to be confused with mealybugs if not examined closely. The immatures, or crawlers, of all species are tiny and yellowish to pinkish, and not easily seen without a magnifier. The most common way of acquiring scale is purchasing an infested plant. 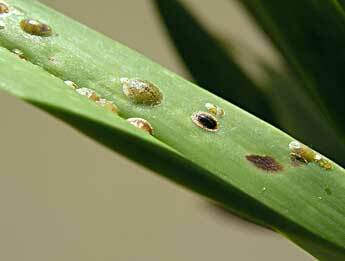 Scale is easily transmitted to clean plants when plants are crowded and crawlers move from plant to plant. Colonization by windblown crawlers may occur when plants are outdoors, but this can also happen indoors and in greenhouses when crawlers float on currents from circulation and heater fans. This can produce pockets of infestation where air currents are weakest when crawlers settle on plants. Scales have three life stages: egg, larva (or nymph) adult. Eggs are laid under the female's shell and remain there after she dies. These hatch into mobile nymphs, called crawlers, that can move between plants. After finding a suitable place, crawlers settle to feed. The females then form a light yellowish protective scale covering, which enlarges as the insect grows and darkens to tan or brown as it matures. Male Boisduval scale form an armored scale while those of brown scales are small winged creatures. The primary role of males is to mate and die. Scales have short life cycles, but may cycle many times a year. Typically, a month or more is required for completion of a scale generation, but a mere two to three weeks is possible in favorable conditions. The overlapping generations create the biggest scale-management problem. All control methods are at their greatest effectiveness against crawlers. By the time the scale has matured the hardened shell, it is too late to easily kill those adults with chemicals. Also, the largest dark brown colored scales with a powderlike substance inside are dead and the shells are often full of eggs. Scale management is usually a protracted and serious effort, and never fun. Light infestations restricted to one or a few plants can be treated with household products rather than concentrated insecticides. When possible, immediately isolate infested plants from others to prevent the crawlers from moving among them. The key to control is persistence. Management methods least toxic to people, pets and plants are the most time consuming and laborious. Chemical methods, including oils, soaps and synthetic insecticides are progressively more toxic and expensive, but less work. Regardless of method or chemical used, remain vigilant and expect to make at least two to three applications 10 to 16 days apart. Due to plant costs, owners' personal attachment to orchids, and many growers' desire to avoid insecticides when possible, a number of effective home remedies for scale are available. However, noninsecticidal treatments may not be highly effective for eliminating scale - they should be viewed as controls, not eradicators. Also, many chemicals for home use are toxic to humans, pets and plants even in diluted forms, often proportionately more toxic than the feared insecticides. Another method is to spray alcohol with a misting bottle or small pump sprayer. When so applied, a few drops or a short quirt of liquid soap are added to the alcohol. Some growers also like to add some horticultural oil, mineral oil or neem oil to this solution. Use caution, as a detergent that is too strong or applied in excessive amounts, or use of an ammonia-based chemical cleaner, may damage your plants particularly buds and flowers. Also, alcohol sprays are not effective against eggs beneath scale coverings, hence physical removal of scales by hand is suggested. When air movement increases evaporative cooling, rapid evaporation of alcohol may over-cool plant tissues, creating zones of dead mesophyll cells that can become necrotic. On warm or breezy days, especially with low humidity, wipe residual alcohol with a tissue instead of allowing it to evaporate. extreme infestation, scale may develop on roots and rhizomes. Consider replacing the potting medium, which can harbor eggs and crawlers. Dispose of it in a compost pile or in the garbage. When repotting, a close inspection, and, if necessary, a gentle clearing and spraying of the roots is essential. Horticultural, neem and mineral oils, and insecticidal soaps form the next stage of chemical control. All of these solutions are generally considered safer for humans, pets and plants than insecticides. None provide absolute control over pests, but frequent applications reduce insect populations to below self-sustainable levels in small orchid collections. Oil solutions smother insects, so complete coverage of all sprayed plants is essential. These oils are mixed with water and a plant-safe detergent for enhancing spreading and sticking. Never apply these solutions to plants on hot days (over 85 F). Insecticidal soaps, while considered safe, may still damage some plants, particularly tender new tissues, and when the soaps are mixed with hard water. They can also cause allergies and respiratory problems for users. Persistent or heavy scale infestations may require the use of synthetic insecticides. Few insecticides are tested on or specifically registered for use on orchids, but several common, inexpensive, home-and-garden chemicals are labeled for ornamental plants. Some of the more effective insecticides available to home growers are Orthene (wettable powder), Malathion (liquid), Diazinon (liquid) and Carbaryl (water-based emulsifiable concentrate). Always follow label directions and never exceed the minimum recommended concentration given in mixing directions. Orchids are tough, but sensitive to many chemicals. While certain species may not react to a given formulation, others might, so advance testing is advised. In the home, growers who must apply insecticides during inclement weather need special care for applications. If outdoor spraying is not an option, spray plant(s) inside a large plastic bag, remove the bag after the spray has settled, and let the plant(s) ventilate where fumes will not invade the home or work area. Never apply any liquid pest treatment in direct sunlight or high heat. To prevent burning of tissues, always shade plants until the solution dries. Insect-growth regulators, such as Enstar II, are synthetic forms of insect hormones that interrupt normal development in insects, including scale. While there is little reliable information on their use on orchids, there have been no plant health problems noted thus far. An increasing number of growers are reporting satisfactory results with Enstar II. Azadirachtin (Azatin and Neemazad) is a plant-derived (neem tree) chemical or botanical insecticide. It inhibits development of chitin, a primary component in insects' exoskeletons, causing mortality. There is little information available on its use on orchids, but it is approved for a wide variety of ornamentals and is labeled for greenhouse applications. Heavy infestations of scale may require other control methods. In such situations, a synthetic insecticide may be useful. On the extreme side, for a plant showing signs of decline from scale, consider whether the low likelihood of rejuvenating the plant justifies the expense and effort of continued treatments. After all, the destruction of a sick plant can be used to justify the purchase of a new and healthier one. To minimize risks of developing a treatment-resistant pest population, change methods and chemicals occasionally; do not use the same chemical mix more than three to four times sequentially. For example, if an insecticide was used for previous treatments, switch to an oil, soap or different insecticide. Never use an insecticide not labeled for ornamental plants, and do not use less than the minimum concentration of a mixture. Too little of a chemical enhances resistance, while too great a concentration may damage plants. Never use chemicals as a routine preventative; this wastes chemicals (and money), and allows resistant pests to develop. Continue manual removal of scales during treatment - removing egg-laying adults is as important as killing nymphs. Finally, always monitor the cycling of the scale population to optimize spray effect and minimize total number of sprays.